I'm a fan of print mixing and I've worn stripes and leopard print together many times before. Sometimes it's just nice to let a print shine on it's own though, and wear a single printed piece with a plain basic, like I did with these maxi skirt outfits. Both outfits I wore with my Rebecca Minkoff Georgina studded gladiator sandals in blush, a great neutral shoe! I've worn this metallic tank with a printed maxi skirt and a striped maxi skirt before, but it's the first time I've worn these two together. I'm quite surprised I haven't worn them together before, it's a great combination. I've not worn this tank as much as I thought I had! I bought it in November before my #6MonthsWithoutShopping started, and this is only it's 5th wear in the 5 months I've had it. Actually paying more attention to the number of times I've worn things and not just seeing how long it is between wears has been an eye opener. It's helping me avoid shopping and stick to the challenge, as I know I won't wear new things I buy that much. I already have an overflowing wardrobe! This was a casual and comfortable outfit, perfect for taking Baby Boy for his weekly weigh and spending time with my mum and sister in the afternoon. Last worn: Ray-Ban Wayfarer, metallic tank, striped navy maxi skirt, studded gladiator sandals, Rebecca Minkoff Love bag. Other ways to wear: metallic tank worn two ways, striped navy maxi skirt with purple, studded gladiator sandals and pritned shorts, Rebecca Minkoff Love bag and chambray. Jeanswest have 40% off for rewards members (free to sign up if you're not one already!). ASOS have up to 50% off in their sale. Lots of good autumn/winter options there! The Iconic have new styles added to their 50% off sale. Had a quietish day with the boys, a couple of errands to run including stopping at the post office to mail some more parcels from my ebay auctions. Almost every time I wear this tee I comment how long it's been between wears, so I'm making more of an effort to wear it. The neon tee and the grey maxi skirt is a combination I actually wanted to wear in pregnancy. I liked this yellow, orange and grey combination and wanted to try it with the leopard print rather than the stripes. Unfortunately while a loose fit, the tee is slightly cropped so it's not ideal for pregnancy wear with a baby bump making it ride up! I'm glad I remembered to give the combination a try now I'm not pregnant, I really liked this. Grey is a great base to pair with such a brightly printed tee. Last worn: Ray-Ban Wayfarer (above), Sass & Bide leopard print tee, grey jersey maxi skirt, Rebecca Minkoff gladiator sandals (above), Rebecca Minkoff micro Regan bag. Other ways to wear: Sass & Bide leopard print tee and purple bag, grey jersey maxi skirt in winter, Rebecca Minkoff gladiator sandals worn 30 ways, Rebecca Minkoff micro Regan bag and denim shorts. Basics don't have to be boring - they are great to pair with printed pieces in your wardrobe. If you have a printed item that you're not sure what to wear with it or how to wear it, grab a plain, block-colour basic piece and let the print be the statement in your outfit. Linking up with Shoe & Tell, On Trend, Turning Heads, Style Sessions, Confident Twosday, Midweek Inspo. I love maxi skirts! 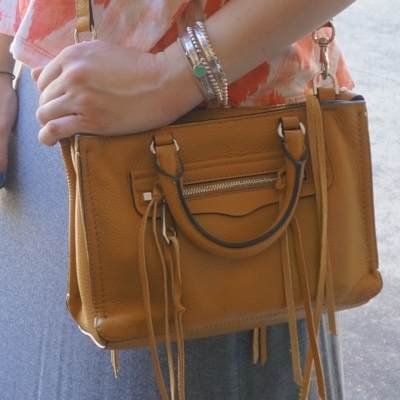 They are so easy to wear but give outfits a little more of a dressy feel :) Also love your bags! I have some pieces in that print in my closet. I like stripes as they give a casual touch to the look. Your comfortable outfit is so nice on you! You always do maxi skirts so well! Love the sandals too. Hope your week is off to a nice start. I like stripes and leopard, but am not a huge fan of neon colors on me. When wearing prints I usually opt formthe safe option and pair them with basics. Glad I could inspire you Kim! I definitely need some more maxi skirts in my wardrobe! I especially love the striped one! You're so right! Basics are just a palette for creativity! You know how to rock a maxi skirt! Thanks so much for linking up with On Mondays We Link-Up! What a cute little bag! The hassles are such a nice touch and the color will be great for fall too :) Have a great week! As you know I'm such a fan of maxi skirts and you're so right, basics are just a foundation upon which to build either by adding a funky necklace - and I love love love your elephant - or a metallic top or printed top. Thanks! It's a teething necklace, perfect for life with baby! I love leopard and stripes together, but I agree sometimes it is nice to just let one print do it's job. That metallic tank is pretty! I always love seeing your bag selection too. Oh I have the same RM quilted cross body on lavender. Don't you just love this bag! I love this necklace you're pairing with your outfits! I love the skirt! I love that orange top on you! I've been on an orange kick lately and have gotten a few orange-y tops! I can't wait to hear what you find out at the end of 6 months months! Leopard print and stripes is one of my all-time favourite print mix combos! Such lovely outfits, Mica! I love to pattern mix too and one of my favorite combo is leopard and stripes, so classic and I feel even more perfect for spring for some reason. I also love to wear a single print and have it serve as the main focal point, as you've done with both outfits! Thanks for sharing and I hope you have a great week ahead! I love the grey and orange together! Glad you remembered to wear it! You are doing such a great job remixing your wardrobe and being aware of what you have! Thanks Laura! I feel I still have so far to go sometimes, I'm always trying to get a better handle on my wardrobe. I have been eyeing up maxi skirts now that the weather is getting nicer here. Can't wait to add a few more and bust them out ! I'm currently having the "everything looks cropped" issue with my own wardrobe. lol I was laying in bed last night complaining my night tee was too tight. haha Literally 5 shirts fit me comfortably right now. I'm slacking! It's hard in the second trimester, the bump grows so quickly! Hope you find some nice alternatives soon :) I bet you look awesome in orange too. The combination of a basic tee and a striped maxi is always a winning look. I also really like the bag. The second outfit is fantastic. That top with orange leo print is wonderful and it looks great paired with that maxi skirt. I agree, sometimes it's nice to just let a print shine through but a classic stripe is always welcomed to me. I really love your second outfit, Mica. I adore colour so the pop of coral/orange in the print looks is up my street. Basics definitely don't have to be boring - I love how you styled this skirt! Hi Mica! I hope you're well. I love these outfits on you. You look beautiful as always, and you have a real flair for mixing prints and colours in a fun and unexpected way. 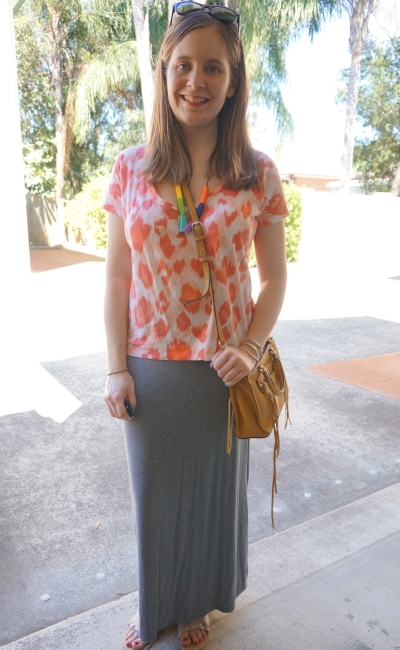 The maxi skirts look lovely on you, and I adore your elephant necklace and silver bangles. Thank you so much for your sweet comment on my blog. You're always so kind and lovely. Maxi skirts are so easy to style and wear! Both looks are lovely, but if I must pick I'd go with the first one. You cannot beat a good striped maxi! Yours is perfect. And I love your micro Regan! So cute! Wow Great Looks my dear!!! Love the orange print of your top and the maxi skirt looks great with it. So much versatility! You know I love your handbag choices, I am looking for a floral or white one at the moment.